In his pursuit of Texas terroir, the sense of place manifest in Texas wine country’s sun-baked soils, variable climate, and human intervention, Russell Kane has traveled the state tasting wine, interviewing the major players in Texas wine culture, and reflecting on the state’s extraordinary history and enterprising peoples. Here is the total immersion experience. 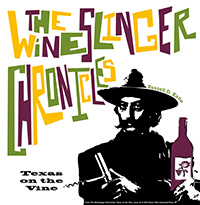 Texas Wineslinger, the moniker now synonymous with Kane, sprouted from a blog of an Australian wine writer after Kane compared the big red wines that originate from the red sand and porous limestone common to both the Texas High Plains and Australia’s Coonawarra wine region. Kane’s reflections include explorations of Spanish missionary life and the sacramental wine made from Texas’s first vineyard as well as the love for grapes and wine brought subsequently by German and Italian immigrants from their homelands. Kane also relates stories of the modern-day growers and entrepreneurs who overcame the lingering effects of temperance and prohibition—forces that failed to eradicate Texas’s destiny as an emerging wine-producing region. A postscript, “A Winegrower’s Prayer,” serves as a poignant reminder of the challenges that weigh heavy on those still defining the terroir of Texas’s wine frontier.